HIGH PERFORMANCE ACOUSTICAL UNDERLAYMENT DURA-SON® 3.5mm (1/8”) is ideal for installations under floated or double glue engineered hardwood floors. 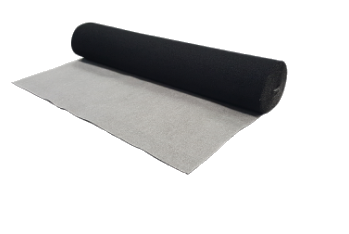 DURA-SON® offers the highest impact sound absorption in the industry being manufactured with an open cellular structure made from recycled tire rubber bonded to fiberglass backing. It is one of the most environmentally friendly acoustical underlayments in the industry with a 85% post consumer recycled content and 100% recyclable. DURA-SON® contributes to LEED credits. Dura-Son MB with its 3 mil. 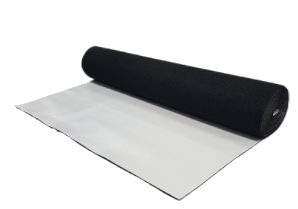 polyethylene Moisture Barrier, is the ideal acoustical underlayment for below grade floating laminate floor installations. It can also be installed under floating laminate floors on-grade and above grade where a vapor or moisture barrier has been specified to go over a concrete slab. In addition to the excellent moisture protection provided, Dura-Son MB also offers all the features and benefits that Dura-Son offers.